Delicious lemons to accompany our meals, fish, seafood, meats and salads; widely used in confectionery and pastry, and recommended for juices and sorbets. Due to its strong acid flavor it always leave a little side, but a good juice with a little water and seasoned with sugar is great, lemon can not miss in our houses because we will always get out of any trouble. Do you know that? Apart from the gastronomic uses, lemons aromatized a variety of home products and are also used to manufacture air fresheners.In cosmetics, astringent and mild tincture qualities are used to create easy potions and lotions that improve our appearance. 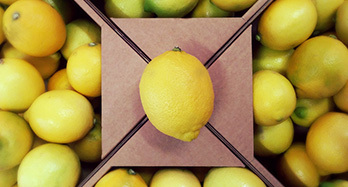 (See, air fresheners, lemon drinks, beauty products and ornaments) On transport, box of 15 kg net of lemons arrive at your home within 24 hours of having been collected in our fields one by one and packed carefully, lemon does not present any difficulty for the transport, due to its hard skin and without artificial waxed . It is one of the most productive trees, originating in Asia and is grown mainly in Spain and Sicily, in Spain the largest crops are found in Murcia and Almeria has a flowering and fruits in large quantity, throughout the year. Lemon juice has a great wealth in vitamins P and vitamins of group B and citric acid, representing 30% of the weight of the fruit, its strong acidity can cause discomfort in the digestive system. Its main use is the fresh consumption in the homes, as well as to flavor certain foods, in confectionery and ice cream, it is also important in the industry for the preparation of soft drinks and as a flavoring in perfumery.